WASHINGTON — President Donald Trump says he does not want to hurt Canada's economy but also warns that if he imposes taxes on cars it would be "devastating" for the neighbouring country. Speaking to reporters Friday on Air Force Once, he said: "I don't want to do anything bad to Canada. I can — all I have to do is tax cars — it would be devastating." He also said he wants to make a "fair deal" with Canada. Trump spoke while Canadian Foreign Minister Chrystia Freeland was meeting in Washington with U.S. Trade Representative Robert Lighthizer. The bilateral meetings picked up after Freeland's late night, 20-minute meeting Lighthizer on Thursday. Freeland called that meeting constructive along with an earlier two-hour session with Lighthizer at his office near the White House. 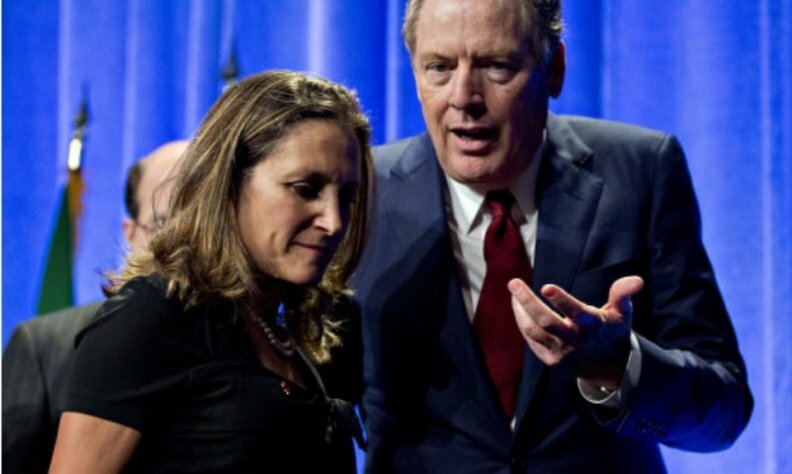 Freeland offered few details, sticking to her mantra of not wanting to negotiate in public _ an agreement struck with Lighthizer as an act of good faith. Canada and the U.S. are trying to agree on a text that could be submitted to the U.S. Congress by month's end in order to join the deal the Trump administration signed with Mexico last week. "It was important to discuss a couple of issues face-to-face," Freeland said Thursday night without elaborating. The hope is for a trilateral agreement in principle that Congress can approve before Mexico's new president takes office on Dec. 1. "We do love Canada," Trump told supporters at a rally in Billings, Montana on Thursday night. "They've treated us pretty badly in trade for the last 40 years, but that's OK, it wasn't my fault. We're going to make a fair deal with Canada, just like we did with Mexico." "We're replacing NAFTA with a beautiful new brand, because it's a much different deal. It will be called the U.S.-Mexico trade deal," he said to partisan applause. Trump said he thinks Canada will join the deal. But if it doesn't, the U.S. can live with that.